There’s a moment in the Joss Wheedon movie Serenity where Wash, the ship’s pilot, exclaimed “I’m a leaf on the wind, watch how I soar”. I was reminded of the scene on my first ride on the new Intense Carbine, as it launched me effortlessly off lips on my first descent. If you want excuses for your riding ability, you’ll need to look elsewhere. Intense have been on a roll recently, relaunching almost their entire range over the past 18 months. So it wasn’t much of a leap to expect the brand from Temecula, California, to do something with the Carbine model. And the photos of Jack Moir riding a matt black bike with Tracer-like suspension design and 29” wheels at this year’s EWS round in Rotorua only reinforced that something interesting was coming. 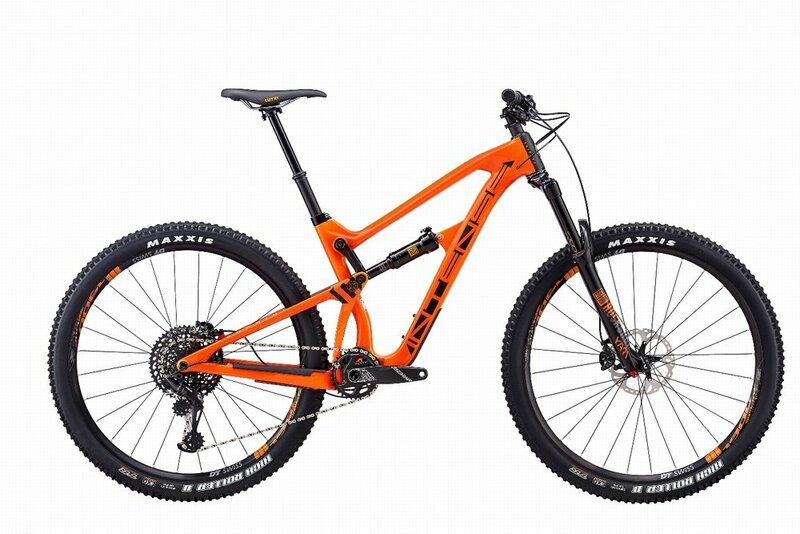 The Carbine, last updated in 2015, has been visited by the enduro fairy, and dances at this year’s ball in a somewhat more capable dress than the 2015 model. The geometry aligns to the du-jour long/slack/low ethos, with a 65.5° head angle, reach of 455mm (on the large size), and BB height of 348mm. All of the rear wheel travel has to go somewhere though, and the chainstays are 445mm, with the overall wheelbase a relatively rangey 1233mm. By virtue of starting well forward of the bottom bracket, the 66° seat tube angle has an effective angle of 74°, meaning that I never felt my weight was too far backwards when riding. 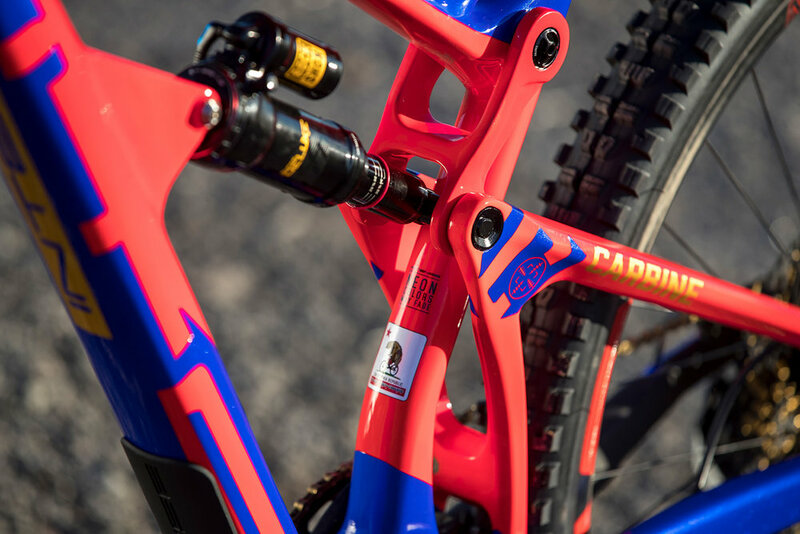 The collaboration with Cesar Rojo and his Cero Design Studio on the 2017 Tracer is obvious with the Carbine, with the 29” bike sharing the “JS Enduro Link System” – an upper suspension link hung from the top tube and the lower link arching over the bottom bracket. The design provides a suspension feel that is very plush at the start of the stroke, ramping up smoothly to the end of the travel. Despite using all of the travel several times when I was riding it, I never felt a harsh bottom out. By the time that the demo bike arrived in Wellington, winter had finally arrived, and many of my go-to trails had received sufficient rain to soak in, turning techy singletrack into a metaphorical search for the needle in the haystack of traction. With slippery roots. The Carbine, pleasingly, lapped it all up. Deliverance, a local trail with a temperament that changes with each bout of rain bared its best rooty teeth, but the Carbine rolled through without a worry. 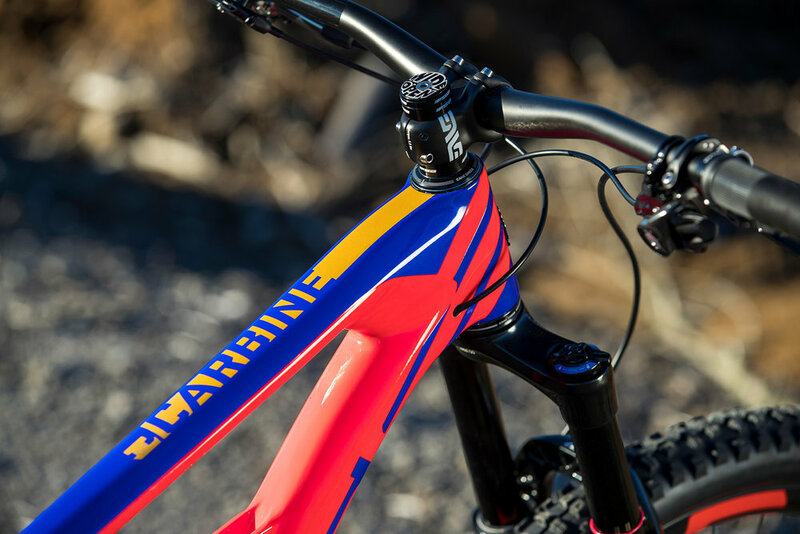 The Carbine climbed a lot better than I expected a 155mm bike to– despite the Super Deluxe shock offering a climb switch, I found that the feel of a bike was much nicer in the open mode. Unlike the 2017, the bike didn’t exhibit any noticeable bob when pedalling. A slack head angle is always going to make climbing more of a challenge than with a more XC-oriented bike, although I never found any situations where the bike became unmanageable on the trails. Despite a year that’s felt like I’m spending more time with health professionals recovering than riding, the Carbine easily whipped me up more than a few 400m+ ascents. But point this bike downhill, and it really comes into its own. It accelerates quickly, and maintains its speed easily. The suspension is very neutrally balanced, making launching of lips and kickers second nature. Heading down Wellington’s Red Rocks, an old-school trail with open, rut and hole-strewn rocky downhills interspersed with short, steep climbs, the Carbine skipped across the trail surface with confidence. And when my confidence caught up with the bike’s potential, and I stayed off the brakes, it revealed what it had been designed to do. Go fast. Very fast, and stable, showing the upside of a longer wheelbase. It’s a bike that you need to actively guide – provide a little bit forward bias on the weight, and push through corners, and you’ll be rewarded by the bucketful. Weighing in at 30.02 pounds out of the box (minus pedals), the Factory build that we tested, is spec’ed with more fruit than a café breakfast salad. With suspension provided by Rock Shox (care of the Lyric 160mm fork and metric Super Deluxe RC3 shock), Enve’s desirable M70HV rims, bars and stem, and a SRAM XX1 Eagle drivetrain, there is literally nothing that I would want to exchange out of the box. 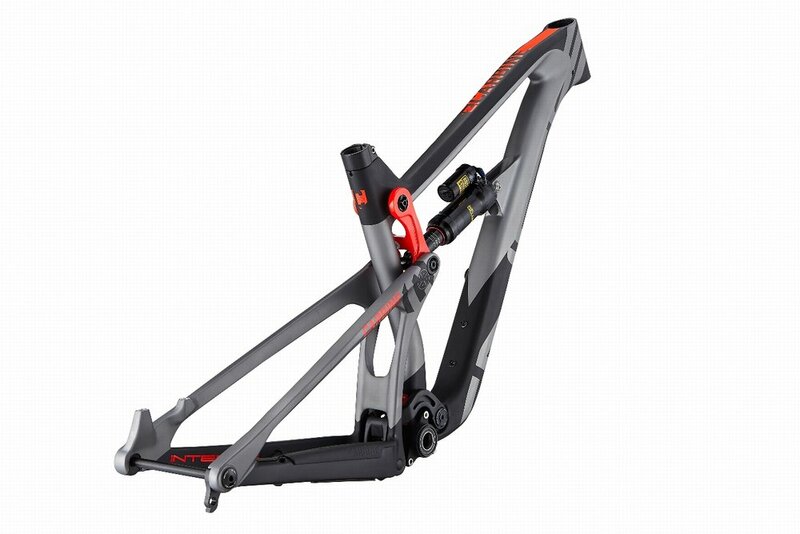 Wide Open (New Zealand Intense distributor) will offer 3 build kits – the $7499 RRP Expert build (which uses a slightly heavier carbon frame and alloy top link, and is spec’ed with a Rock Shox Yari fork, Rock Shox Deluxe RT3 shock, Fox Transfer 150mm dropper post, DT Swiss M1900 wheelsets and SRAM GX 12 speed drivetrain), and the $8999 RRP Pro build (which uses the same high-modulus carbon frame as the tested Factory build, with carbon top link, and is spec’ed with a Lyric RTC3 Solo Air fork and Super Deluxe RC3 shock, Fox Transfer 150mm dropper post, DT Swiss M1700 wheelset, Truvative carbon cranks, Intense carbon bars and a SRAM GX Eagle 12 speed drivetrain). Finally, Wide Open will also offer their custom “Rotorua build”, with a selection of their own parts matched with your choice of Shimano or SRAM drivetrains. The Cabine will also be available in frame-only form. The Elite frame is available in a very striking red and blue (shown in the photos here), or, if you find that a bit vibrant, a black and grey (with the same red top link). The Expert frame will be available in Orange or Black colourways. Not so good: The rear wheel uses a split collet axle, which means removing the rear wheel takes a bit longer. Don’t overtighten it – getting an allen key in there afterwards can be tricky. What are you going to do with all those 27.5” tyres you used to need?